TurboJET is committed to offering the ultimate travel experience for all passengers. Economy, Super and Premier Grand class are designed to cater for different needs of the passengers. The cabins are well-equipped with audio and visual systems, bringing a wide range of round-the-clock onboard programs and the hippest trends in town to passengers. At the same time, a selection of food, beverage and duty-free goods are also available for passengers to choose from. ​TurboJET's Super Class is designed with flexible adjustable contoured-seats and provides passengers with a series of value-added services such as complimentary meal and newspapers, priority disembarkation and the exclusive use of Super Class waiting lounge. Furnished with 4 seating VIP cabins best suit those travelling with friends and relatives, providing enhanced privacy in the journey. Please fill in the name on your ID card or travel document. The name you enter will be embedded on the e-ticket and must be one of the travellers. Return sailing ferry ticket date must be issued within 40 days of the departure sailing date. No cancellation, refund or reschedule will be allowed once booking is confirmed. "Open Day Sailling" function is applicable for bookings of 6 sets of tickets or less. Sailing time is approximately 60 minutes between Hong Kong and Macau. For Sailing Schedule, Please click here. 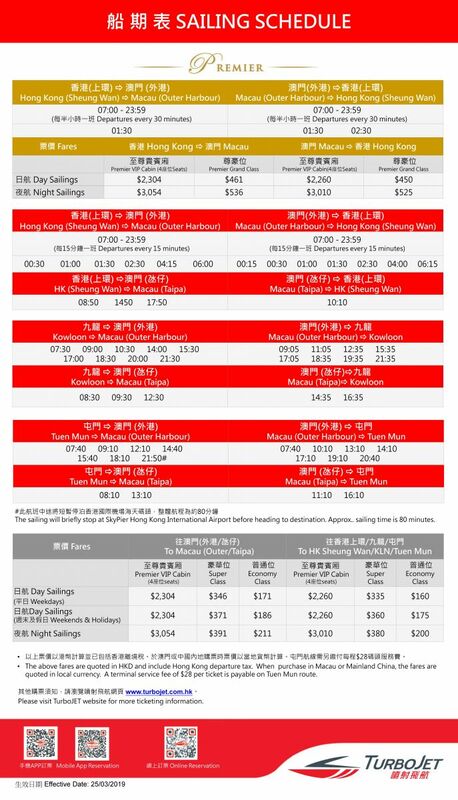 The above fares are quoted in HK dollar and include Hong Kong departure tax. Children aged 1 or above must travel with valid ticket.